TRSA Spotlights Faultless Healthcare’s New Facility! 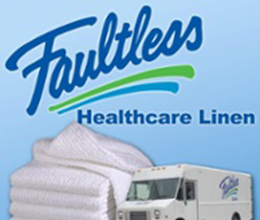 Balloons and blue and green signs heralded the formal opening of Faultless Healthcare’s new 100,000-square-foot healthcare laundry in St. Louis on Nov.
TRSA Celebrates 100 Year Anniversary! MEDtegrity Healthcare Linens & Uniforms would like to take this time to congratulate TRSA on their 100 years of supporting textile rental services. MEDtegrity Members Are Certified Green! MEDtegrity member Dempsey Uniform and Linen Supply uses innovative technology to solve problems that healthcare providers deal with every day.